TBILISI, DFWatch–A female police officer who was injured in a shooting on Wednesday in Telavi died later the same day. 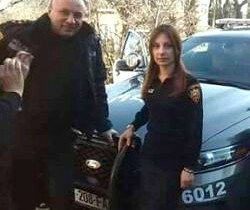 Maia Javakhishvili was injured during a shooting in front of a police station, while her partner, Captain Gela Lamazoshvili, died on the spot. The suspect, a 19 year old, was arrested. The Interior Ministry ruled out revenge as a motive. Interior Minister Giorgi Mghebrishvili said after arriving in Telavi that the suspect has psychological problems. Witnesses told Interpressnews that the killer used an automatic hunting rifle. Governor of Kakheti Irakli Shiolashvili told journalists that the local municipality has cancelled all New Year’s events, including a concert.